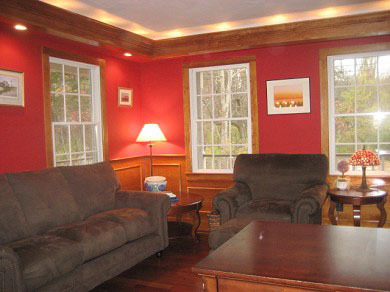 Our house is a great vacation rental with something for everyone in the family to enjoy. 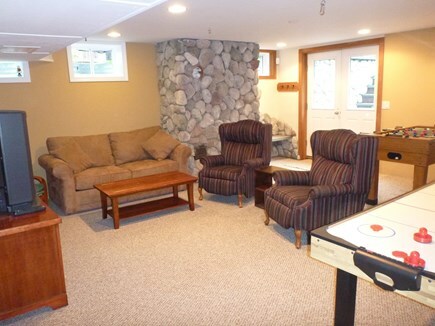 Our house is located on a private road in a quiet neighborhood and is within walking distance to a private beach, as well as to the public Skaket Beach on Cape Cod Bay. We are centrally located to the bike trail and Nickerson Park, as well as town. Nauset Beach and fresh water Pilgrim and Crystal Lakes are less than ten minutes across town. This three bedroom house has been built with attention to detail. Every room will offer you some impressive feature that will enhance your overall rental experience. The master bedroom, with walk-in closet and private bath is like its own private escape from your vacation. 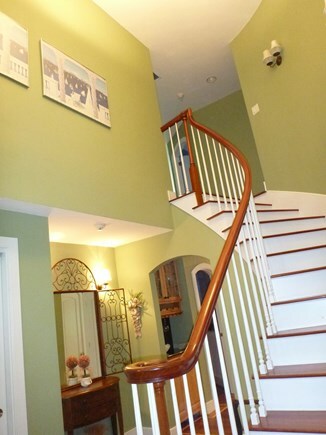 There are three floors in this spacious house, so there is space for everyone to relax and enjoy. This house features open spaces in the living room and gourmet kitchen. 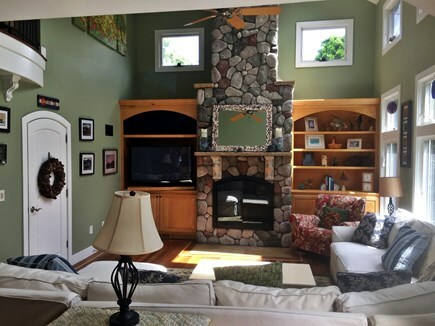 The living room has vaulted ceilings and a floor to ceiling stone fireplace with south facing windows and sky lights that bring in the sunshine. The gourmet kitchen offers granite countertops, a five burner gas range, double ovens (one being convection) and a warming drawer. The kitchen comes equipped with all the tools to do a Cape Cod clam bake. Other rooms on the main floor include a powder room, formal dining room and a cozy den with a desk and wireless internet connection. There is a two car garage and a laundry room off the living room with a front loading washer and dryer. 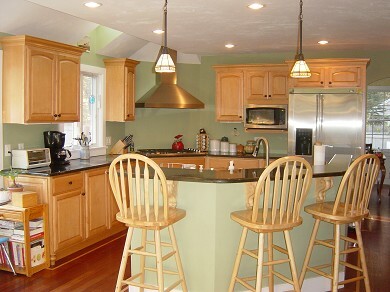 The laundry room is also equipped with a utility sink, wine fridge and a second small fridge for beverage storage. Linens and towels will be provided. There is central air conditioning and a central vacuum throughout the house. 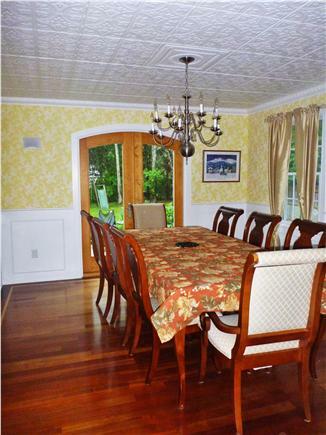 There are Brazilian hard wood floors throughout the main floor and the master bedroom with beautiful nautical inlays. Upstairs there are three bedrooms and two full bathrooms. 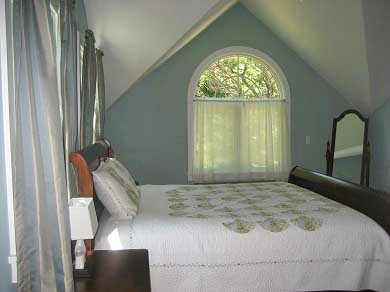 The master bedroom has a king-sized sleigh bed with a walk-in closet and satellite TV. 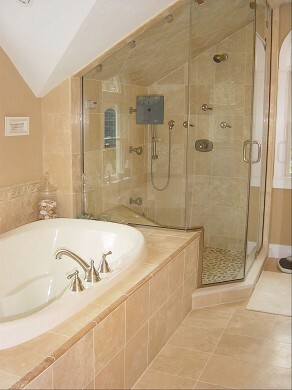 The master bathroom is a beautiful place to relax after long days at the beach. It has double sinks, a Jacuzzi style tub and a separate shower (with steam and multiple shower heads) and a separate water closet. The second bedroom is carpeted and very spacious. It can sleep five with a queen bed and three twins. The perfect bedroom for a family to enjoy. 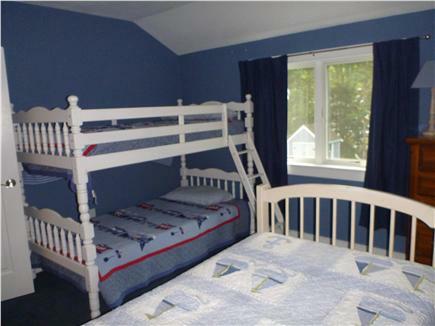 The third bedroom is carpeted and can sleep three comfortably with one twin bed and bunk beds. The second bathroom is a full bathroom with a deep tub and is beautifully decorated with sea-themed mosaic tiles. The bottom level of the house is a carpeted playroom equipped with a pull-out sleeper sofa, satellite TV, fooseball and air hockey tables. 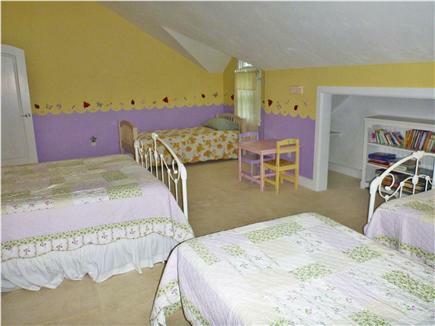 There is also a half bath on the bottom floor to accommodate anyone sleeping on the sofa. The outside of the house features a professionally landscaped front yard, as well as magnificent perennial gardens in the back surrounding a blue stone patio. The back yard is completely fenced in, to keep children safe and in sight. On the patio there are chairs and table plus a stainless steel gas grill. On the side of the house there is also a large outdoor shower to help remove all the sand from the days of play at the beach. After a wonderful day in the sun and surf there are many wonderful dining experiences in Orleans. Within walking distance from our house is the renowned Captain Linnell House restaurant. Other wonderful dining experiences await you at the nearby Mahoney's Atlantic Bar and Grill, Abba and The Beacon Room restaurants to name a few. For the family fare there is the Jailhouse Tavern, The Lobster Claw or the Land Ho. All of these are only a short drive to town. We are close to the ball fields to watch the Cardinals play baseball, as well as offering the town tennis courts and a fenced in playground. Orleans is centrally located to wonderful towns on the Cape that all have many things to offer. There is shopping along Route 6A in Brewster as well as on Chatham's quaint Main Street. To the north there are wonderful shops, galleries and restaurants in Wellfleet and even further north, to the tip of Cape Cod is Provincetown. Wonderful family memories can be made with a whale watching trip off Provincetown. A great time can be had people watching on Commercial Street, as well as exploring the wide array of galleries, shops and restaurants. To the south of Orleans, about thirty minutes away is Hyannis with ferries that sail to Martha's Vineyard and Nantucket islands. Also we can recommend fishing charters or kayak rentals, all just minutes away. My wife and I have been going to The Cape for the past 20 years and have stayed in many areas in many different accommodations. Orleans is the perfect place to stay if you love the mid-cape as we do. It is just a short distance to Chatham, P-Town and the Wellfleet Drive-in...all places we love to visit. The home surpassed all of our expectations from the fabulous master suite to the fully stocked gourmet kitchen. 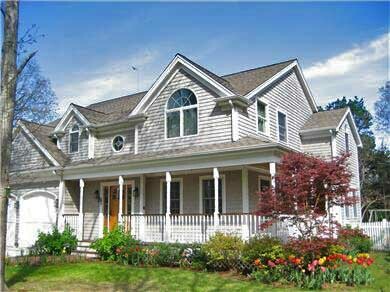 We hope to stay in this lovely home again on a future trip to The Cape. 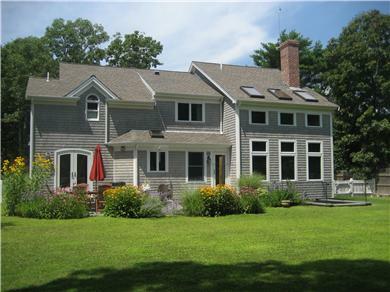 This home is convenient to a private bay beach, shopping, and the Cape Cod Rail Trail. The neighborhood is quiet and peaceful. It's also a short drive or bike ride to Nauset Beach across town. We haven't rented a house on the Cape before so we cannot compare. We were very pleasantly surprised to find a well stocked kitchen with all the spices and utensils, all beach accessories including chairs and an umbrella, and even spare batteries for the clocks. It was as if we had left our own home for a week away. All the little things made it very easy to spend a relaxing week on the Cape.